This book is also available, brand-new, from 3rd-party marketplace sellers at Amazon.com, from $289.00. Handbook of the Birds of the World. 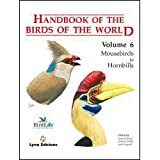 Volume 6 (Mousebirds to Hornbills).